"Please give me a Mexican hot sauce recipe!" There is a small hole-in-the-wall Mexican joint that Uncle Daddy goes to for lunch a lot and that's what I told them. The nice lady that owns it shared these traditional recipes with me. I like hot sauces of all types, and I try a lot of strange & exotic stuff. Sometimes though, you just gotta love the basic traditional concoctions. Lots of folks don't realize it, but most peppers that are typically sold green will turn red when ripe. When they do turn, though, they usually start to go bad soon. So if you have some peppers starting to get red and soft you can use them in this sauce. 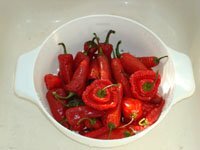 It's also great if you grow peppers in the garden and you have a lot of them at the end of the season and they are going ripe on the plant. You can pick them ripe and red and either make this sauce right away or put the peppers in the freezer until you are ready. Finally, if you just love this sauce and all you have is green peppers you can always let them sit out on your counter until they turn red and then make the sauce! You can use a mix of whatever peppers you have available. Uncle Daddy typically doesn't mix ripe and unripe peppers in the same sauce, but either can be used for different flavors. This recipe is a bit rough since it's passed down mostly verbally. Anyway, here's the End of Season Mexican Hot Sauce Recipe. In this picture I've got a mix of peppers from my garden including jalapenos, Fresnos, cayenne, red habanero, scotch bonnet, and some bird peppers. 1. 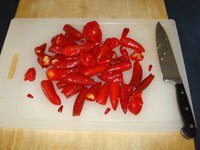 Remove stems and any bad spots from the peppers. Put them in the blender seeds and all. 2. Add enough vinegar to cover the peppers and some salt. Blend until fairly smooth. 3. Pour into a saucepan, bring to a boil, reduce heat and simmer 10 minutes. 4. Funnel into a clean bottle or jar, cover, and let sit undisturbed at room temperature for 3 days. Save your wine bottles! 5. Pour off all but a thin layer of vinegar from the top. Put the sauce into the refrigerator until ready to use. If you want, save the peppery vinegar you poured off. It's great on a lot of stuff, too! This sauce keeps a surprising length of time in the fridge. The more salt and vinegar in the batch the longer it keeps. If it gets smelling funny or moldy you need to make a fresh batch, but who doesn't eat it before then?! 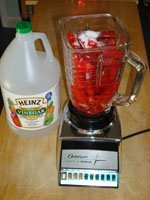 Leave Mexican Hot Sauce Recipe and go back to Hot Sauce Recipes main page.